Born in Blackburn, England, Ian McShane is the son of professional soccer player Harry McShane, who played for Manchester United, and Irene McShane. He attended the Royal Academy of Dramatic Art. His earliest film appearance was in the 1962 film The Wild and the Willing, which led to other leading roles in Battle of Britain , If It's Tuesday, This Must Be Belgium, The Last of Sheila, Villain (co-starring Richard Burton), Exposed and Agent Cody Banks . McShane has enjoyed a long and creatively diverse career in both British and American television, including a role in the David Wolper's seminal 1970s miniseries Roots as well as BBC and BBC America's Trust. Starring turns in Whose Life Is It Anyway? for Granada TV, the role of Heathcliff in the BBC miniseries Wuthering Heights and Harold Pinter's Emmy award-winning The Caretaker are among his other television highlights. McShane has also stepped into roles as well-known figures, taking on parts as Judas in NBC's Jesus of Nazareth directed by Franco Zeffirelli, Prince Rainer in the network's The Grace Kelly Story and the title role in Masterpiece Theatre's Disraeli. Additional miniseries credits include Charlie the Kid, A.D., The Great Escape II, Marco Polo, Evergreen, War and Remembrance and The Pillars of the Earth. In the late 1980s he formed McShane Productions, which produced the extremely popular series Lovejoy for the BBC and A&E. 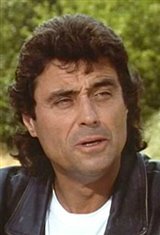 Lovejoy gave McShane a vehicle to star in as well as produce and direct. He followed his lovable rogue character by producing and starring in the darker and more serious lead role in Madson and the comedy-drama Soul Survivors for the BBC. In 2000 McShane returned to London's West End to make his musical debut starring in Cameron Mackintosh's The Witches of Eastwick as Darryl Van Horne. His varied stage career has included roles as Hal in the original cast of Loot, the title role of The Admirable Crichton at the Chichester Festival, Tom in The Glass Menagerie and Charlie in The Big Knife. He co-starred with Judi Dench and Ian McKellen in The Promise, which successfully played London and debuted on Broadway. In Los Angeles he starred in three productions at The Matrix Theatre, including the world premiere of Larry Atlas' Yield of the Long Bond and two others for which he received the Los Angeles Drama Critics' Circle Award, Inadmissible Evidence and Betrayal. McShane earned the coveted Golden Globe Award for Best Actor in a Television Drama for his versatile performance as Al Swearengen on HBO's hit series Deadwood. His charismatic and alluring performance also led him to a 2005 Emmy and SAG nomination for Lead Actor, as well as being voted by People magazine in 2005 TV's Sexiest Villain. Following a wave of critical acclaim for the first season of Deadwood, which also included receiving the Television Critics Association's annual award for Individual Achievement in Drama, McShane was named as one of GQ's "Men of the Year." In the past several years, McShane's unique voice has been heard in two DreamWorks releases, first as Captain Hook in Shrek the Third as well as the voice of the villainous snow leopard Tai Lung in Kung Fu Panda . He also voiced Mr. Sergei Alexander Bobinsky in Coraline and the role of Ragnar Sturlusson in The Golden Compass . In 2006, McShane was seen in Woody Allen's Scoop alongside Scarlett Johansson and Hugh Jackman; that same year he starred opposite Matthew McConaughey in the Warner Bros. true-life drama We Are Marshall (2006). Other major motion pictures include Case 39 (2009) with Renée Zellweger and Pirates of the Caribbean: On Stranger Tides (2011), in which he played Blackbeard opposite Johnny Depp's Captain Jack Sparrow. McShane also starred as one of the dwarves in the 2012 film Snow White & the Huntsman alongside Charlize Theron, Kristen Stewart and Chris Hemsworth. More recently, he starred in John Wick (2014) with Keanu Reeves, Grimsby (2016) with Sacha Baron Cohen and Rebel Wilson, and reprised his role as Winston in John Wick: Chapter 2 (2017). Obviously a very prolific actor, in 2019 Ian played roles in four films – Hellboy , Bolden , John Wick: Chapter 3 - Parabellum and Deadwood. Ian and third wife Gwen Humble reside in Venice Beach, California. Divorced twice, he has two children from his second marriage.